Our organization is offering a wide range of Jewelry Tools and Gauges, which is sourced from the authentic vendors of the industry. We offer these at market leading prices. Our range is in high demand and in appreciated for its unmatched quality features. 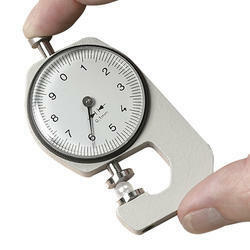 Our range of Pearl Gauge is used to check the sizes and height of precious and semi precious stones. These are available in 10 mm & 20 mm size with least count of .1 mm. We offer these at economical prices. Our range is procured from the reputed and certified manufacturers of the industry and is customized in accordance to our valued patrons. 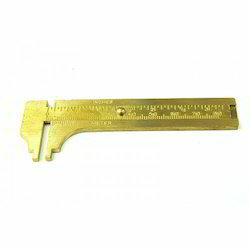 The range of Brass Vernier Caliper we offer is used to check the size of precious and semi precious stones sizes, which is available in 60 mm & 80 mm & 100 mm. Our range is in high demand and is reckoned for its accuracy, durability and long lasting life. We offer these at market leading prices. 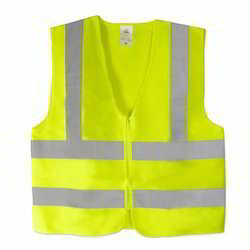 Further, these are procured from the authorized vendors of the industry. Riding on unfathomable volumes of industrial expertise, we are actively committed towards providing world class Diamond Indenters. Apt for cutting and shaping various diamonds, these indenters are well known due to their remarkable features. These indenters are manufactured under the direction of our experienced team members as per the industry set norms. Besides, we provide these indenters to the clients in several specifications at reasonable rates. Diamond Indenter is an instrument that measures hardness by indenting a material with a diamond point. 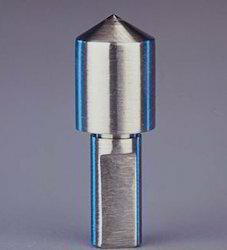 Diamonds are mounted on Rockwell Indenter in exact conformity to its grain structure preventing premature breakage caused by unbalanced diamond pressure. Our exclusive gem polish insures eliminates sidewall friction and error due to metal gathering up around the indentation insuring reliability and longer life to the Rockwell diamond indenter We manufacture Diamond Indenters for Rockwell / Superficial / Portable / dynamic hardness testing Machines.